OMG! It’s a teddddyyyyyy!!!!!!!! He is sooo cuuteee…. Teddy Parker is here to be your child’s best friend. Let your little bundle of joy enjoy being Parker’s doctor. Let the teddy fascinate your buttercup to a new world of happiness, joy and creativity. A magical journey with Parker is going to make your child’s world so much special. Wifi, batteries, and camera! Mind you, these are a big NO-NO! Parker needs care, attention and love! Make your baby pie’s wish come true of being a doc. Parker has got a tummy bug, oh-no! What to do! Download the free Parker App and surprise your little angel with the enchantingly charismatic world. Guess what? Parker has a special thermometer. 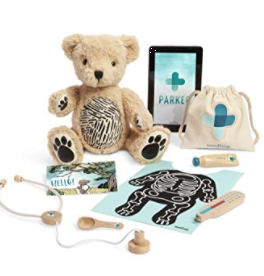 Let your little one enjoy curing and soothing the Parker’s bones and throat using your mobile device. A complete transformation to a new magical world of augmented reality effects, playing with Parker’s happiness factor can let him grow better and happier. Through the magic camera, beautify the world of Parker with the help of your little buttercup. Compatible for all android Lollypop 5.0, iOS 10 and Kindle devices running Fire (2015), Fire HD 8 (2015), Fire HD 10 (2015), Fire HD 8 (2016), Fire HD 7 (2017), Fire HD 8 (2017), Fire HD 10 (2017), Teddy Parker is the STEAM toy offering your angel faces to be the lil caring doc and learn multi-dimensional way of learning and weaving a new magical world. You can find it on Amazon (currently $59.99).